A north east arts organisation is inviting people to join in a political rally this weekend. 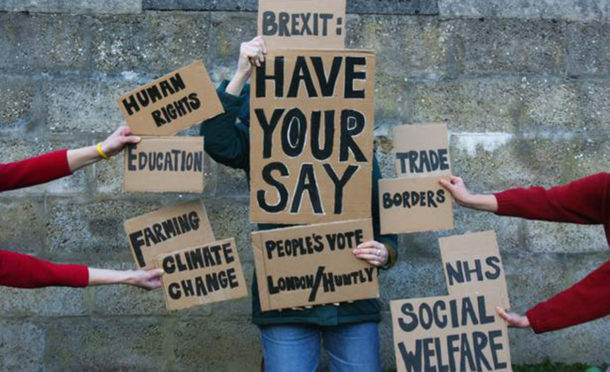 Deveron Projects is organising an event in Huntly to coincide with the People’s March Vote in London as part of a programme of events exploring what might happen in the run-up to Brexit. Project director Claudia Zeiske said: “Building on Aberdeenshire’s stance as the first council region in Scotland to back a People’s Vote on the final terms of Brexit, we wanted to add our voice to the debate. “Over the years, we have been inviting artists from across the world to come and live and work in Huntly looking at local issues from an international perspective. “By holding the Huntly march at the same time as the event in London, we want to link local issues with those being raised nationally. The People’s March event in Huntly will start in the Brander Building on Saturday at noon with a banner-making session and a discussion. This will be followed by a march from the Square to Huntly Castle.